Sarrita King has always been inspired by the world around her. Much of her interpretation of the natural world and its elements has come from her father, the late William King. William was an amazing artist who had a gift in connecting people with the world through his art. Growing up in Darwin in Australia’s Northern Territory, Sarrita was close to her Gurindji country that her ancestors inhabited. The rolling sand hills, crackling lightning and thunderstorms, torrential rain, fire, desert and tangled bush are all characteristics of the brutal landscape that shaped her forefathers’ lives and also her own. Sarrita’s connection to the land and her Aboriginality were able to flourish, and her strong sense of self and pride fuels her drive to paint her totemic landscape today. Her aesthetic has a universal appeal and provides an entry point for people to experience the power and uniqueness of the Australian landscape and its harsh environment. By depicting the environmental elements in her paintings, King provides a visual articulation of the earth’s language. At only 29, King has had many personal achievements, including over 30 exhibitions and has been acquired by many high-profile Australian and international art collections, as well as being auctioned many times successfully through Paris’ Artcurial auction house. The future looks bright for Sarrita, as her desire to visually communicate her inspiration and the land has resulted is works that are vibrant, striking and contemporary. 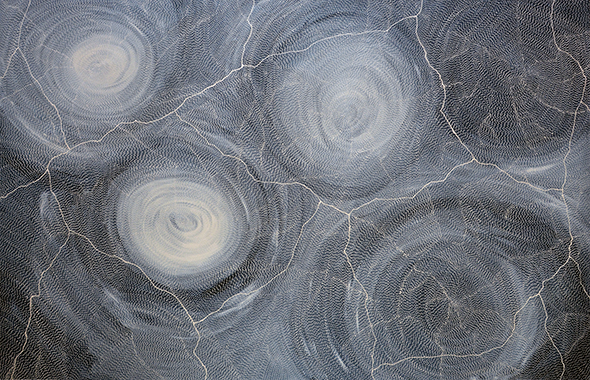 This painting is inspired by her Gurindji ancestors and the great storms found in their land. One of Sarrita's first memories is of the storms and lightning found in the top end of Australia. Sarrita remembers the movement through the rain and wind and also the energy present. This is part of an exquisite new body of work by Sarrita that can be viewed online here. The swirling background colours really do give a fantastic sense of movement, as well as providing a beautiful depth and mood. We really recommend 'home trialling' one of these gorgeous new works, as they are highly versatile and can work in an array of settings. Not in Sydney? We can always do a 'digital hang' for you! 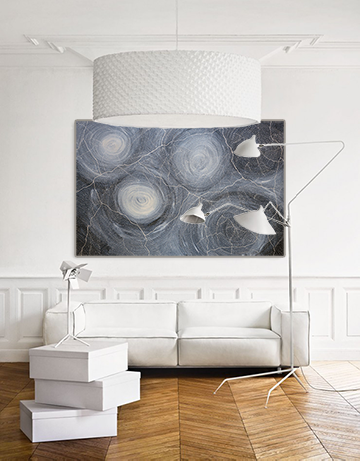 Simply send through images of the space and we will send the images back with the artwork hanging on your wall.